For its rugged build, bevy of useful features and a rechargeable battery that last so long that you might never have lean on its temporary power sources (such as a hand crank), the Midland ER310 emergency radio is tough to beat. If you want to keep tabs on severe weather before it gets too late, a Sangean model is our top choice. The Sangean CL-100 is packed with useful features, such as SAME technology, selectable alerts and auto-shutoff when a message ends -- all designed to keep the Sangean from annoying you with unnecessary or repeated warnings. When it's not reporting on weather and other emergency alerts, users say it makes a great clock radio, with good FM reception and sound quality. Build quality is superb, and most find it very easy to use. For those who don't need advanced features, reviewers recommend the Midland WR120. It's Public Alert-certified and SAME-enabled, and most owners find it very reliable. It lacks selectable alerts, so you won't be able to skip alerts in your area that don't interest or effect you (such as thunderstorm warnings in the middle of the night). Still, at about half the price of other top-rated weather radios, owners consider it an excellent value. The Midland ER310 is an outstanding emergency radio that's loaded with useful features. It has multiple emergency power sources (including a hand crank, AA batteries and a solar panel) plus a super-long-life rechargeable battery that's rated for up to 32 hours when fully charged. It moonlights as an AM/FM radio, alarm clock, flashlight, cellphone charger and more. Users say it's reliable and easy to use, with great reception and good sound quality. The flashlight is super bright, too. What's a weather radio, and why do you need one? The term "weather radio" actually has two different meanings. First, weather radio is a service provided by the National Oceanic and Atmospheric Administration (NOAA) that puts out a constant stream of updates about upcoming weather events and other emergencies. In addition to weather, NOAA Weather Radio (NWR) issues alerts about natural disasters such as earthquakes and avalanches, environmental events such as oil spills, and public safety emergencies, including 911 service outages and Amber Alerts about abducted children. These messages go out on seven VHF frequencies specifically reserved for them, so you can't pick them up on a standard AM/FM radio. That leads to the second meaning of the term: A device capable of receiving these NWR broadcasts. When a natural disaster is on the way, a weather radio can make the difference between being trapped and making it to safety. A desktop weather radio costs between $25 and $60. It can be plugged into an outlet most of the time and supplemented with backup batteries if the power goes out during an emergency. In addition to their NWR function, some weather radios can double as AM/FM radios; if you're listening to music when an NWR alert comes in, the radio will automatically interrupt the broadcast to give you the news. To keep your listening from being interrupted with alerts that don't affect you, the best weather radios include a feature called Specific Area Message Encoding (SAME). With SAME, you can elect to only hear the alerts that apply to your specific location. Some weather radios also let you filter out alerts that are of no interest -- such as a frost warning for someone who lives in the city. Cutting down on irrelevant alerts helps make sure that you pay attention to the ones that could directly affect you. One specialized type of weather radio is an emergency radio. While a standard weather radio informs you about emergencies as they develop, an emergency radio helps you keep abreast of the situation while it's in progress. Most of these radios can run off battery power, but also include crank-driven generators (and sometimes solar panels) that can keep them running during a prolonged power outage when no batteries can be found. 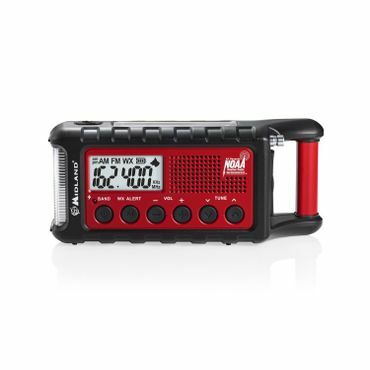 Most crank radios cover standard AM and FM bands, as well as the weather bands, and some include extra features such as a flashlight and a cellphone charger. These radios can be lifesavers during emergencies, but they're also useful for more pleasant occasions, such as camping or hiking trips. However, most crank radios do not include features like SAME or selectable alerts. Emergency radios usually cost about the same as desktop weather radios -- between $25 and $60, depending on features. "The Best Emergency Weather Radio"
"Best Crank Radios of 2017"
"What You Should Know About Configuring Your Sangean CL-100 Clock Radio"
Wirecutter and Top Ten Reviews conduct helpful tests of emergency radios – draining their batteries, dunking them under the shower and hiking with them back of beyond to find out which will be most useful in a crisis. For desktop weather radios, though, recent credible expert reviews are hard to come by. Instead, most of the recommendations in this report are based on feedback from retail sites, such as Amazon and Best Buy; user forums, such as eHam.net and WXForum; and enthusiast blogs. Among desktop weather radios, no model gets more consistently positive reviews than the Sangean CL-100 (Est. $55). It includes nearly every feature you could ask for in a weather radio: Public Alert certification (see the Buying Guide for more information), SAME technology, selectable alerts and a memory function that stores the last 20 alert messages. Users especially appreciate the fact that the CL-100 automatically shuts down at the end of a broadcast alert, rather than waiting for you to get up and turn it off. Moreover, reviewers say that the Sangean CL-100 is not just a great weather radio; it's a great radio, period. Users at Amazon say it has good FM reception, and its sound quality is far better than you'd expect from a weather radio. Radio enthusiast Jeff McMahon even uses the CL-100 as his bedside clock radio: AM reception in particular is "amazing for a radio this small," he writes on his blog, Herculodge. The Sangean CL-100 also includes RBDS (Radio Broadcast Data System) compatibility, which provides additional information in text form about radio broadcasts, and functions as an alarm clock (in either music or buzzer mode). Owners are impressed with the CL-100's build quality, and most of them describe it as very easy to set up and use. However, the few owners who ran into problems say that Sangean's technical support is disappointing. The Sangean has a one-year warranty. The Midland WR300 (Est. $60) receives far more feedback from reviewers than the Sangean CL-100, but that feedback is more mixed. 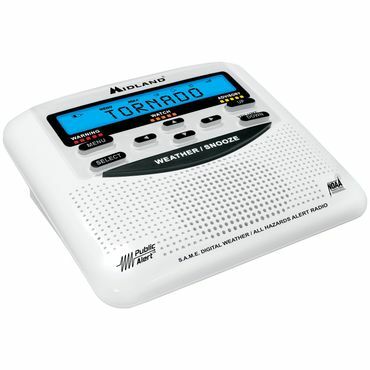 Like the CL-100, this weather radio is Public Alert-certified and SAME-equipped, with selectable alerts. However, unlike the Sangean, it doesn't shut off automatically at the end of an alert message, a feature many users say can be really annoying in the middle of the night. Also, while the Midland can double as an AM/FM clock radio, most users say these additional features don't work nearly as well as its weather alerts. But the main weakness of the Midland radio is reliability. Some users say the device stopped receiving alerts after a period of several months, while others say it never worked properly. Midland has introduced a newer version, the Midland WR400 (Est. $65); its main difference is that it includes a USB port to charge phones, tablets, etc. We can't render a judgement on the WR400, however, as it's received no credible expert reviews, and even user feedback is limited. Midland radios have a one-year warranty. The Reecom R-1630 (Est. $55) doesn't have nearly as much feedback as either the Midland WR 300 or the Sangean CL-100 from experts or users at retail sites such as Amazon. However, it's the most recommended weather radio at sites for radio buffs, such as eHam.net and WXForum. Users there praise its sensitivity, easy setup, reliable performance and wealth of features. While it has lots of key features, such as the end-of-message (EOM) response that the Midland so annoyingly lacks, other useful features, such as the ability to receive standard AM/FM broadcasts, are missing. Reliability appears high based on the feedback that's available at Amazon and elsewhere, but with a caveat -- the few users who had problems say that Reecom's representatives are rude and unresponsive, and it's all but impossible to get them to honor their one-year warranty. 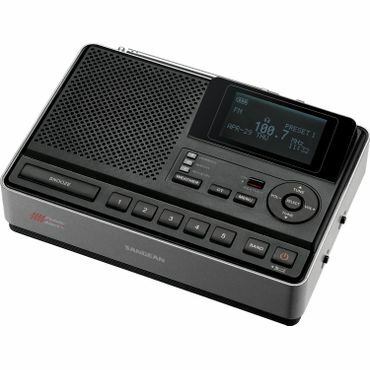 If you just need a cheap, reliable weather radio, the Midland WR120 (Est. $30) is your best bet. This stripped-down version of the WR300 actually gets better overall reviews from owners than its pricier sibling; there are still a few complaints about malfunctions, but most owners describe it as very accurate and reliable. Their biggest complaint is that unlike the WR300, the WR120 doesn't let you block unwanted alerts—a frustrating feature for owners who don't want to be awakened in the middle of the night for a non-life-threatening weather event. It also lacks AM/FM/clock radio functionality, but given how poorly those features are regarded on the WR300, that might not be all that much of a loss. Users generally have less trouble programming the WR120 than they do with the WR300, but a few owners still find it difficult.